There was a time when Doug Melvin wondered if he could cut it as a major-league executive. Fortunately for the Milwaukee Brewers GM, many of his decisions in his 37-plus years as a player and executive at a high level have worked out, which is why the Canadian Baseball Hall of Fame named him to its 2012 induction class, writes CBCSports.ca senior writer Doug Harrison. 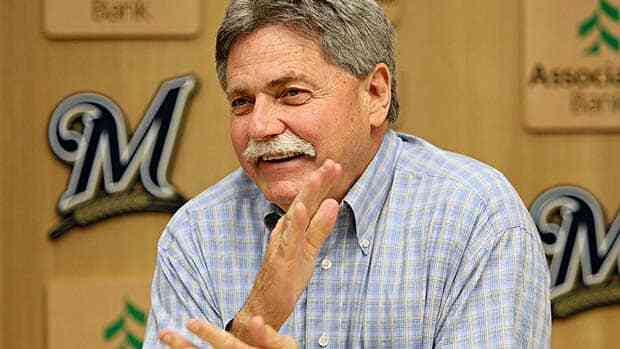 There was a time when Doug Melvin, the man behind the Milwaukee Brewers' 96-win season in 2011, wondered if he could cut it as a major-league general manager. He had just watched his 52-62 Texas Rangers finish first in the American League West in the strike-shortened 1994 season and - fresh off his first year in the role - wanted to put his stamp on the ball club. Seeking a leadoff hitter and improved defence in centre field after David Hulse and Jeff Frye failed to deliver, the Chatham, Ont., native traded 30-year-old slugger Jose Canseco to Boston in a bold move for 36-year-old Otis Nixon and backup third baseman Luis Ortiz. "But later on ... you find out that not all of your decisions are going to turn out well. That [Canseco deal] did turn out OK. We won the [AL] West Division [in '96]." Fortunately for Melvin, many of his decisions in his 37-plus years as a player and executive at a high level have worked out, which is why the Canadian Baseball Hall of Fame named him to its 2012 induction class. He will be honoured, along with one-time Montreal Expos Rusty Staub and Rheal Cormier and the 2011 national men's team, in St. Marys, Ont., on June 23. When it comes to making decisions, Melvin learned early in his career working under New York Yankees owner George Steinbrenner and Baltimore Orioles GM Roland Hemond to develop a thick skin. "You have to make a decision, get all the [scouting] information you can from your people," said Melvin, Baseball America's executive of the year recipient for 2011. "In the end, you hire good, quality people and give them the latitude to do their jobs and guide them to help them make those [important] decisions." In December 2010, he dealt several prospects, including infielder Brett Lawrie, outfielder Lorenzo Cain and shortstop Alcides Escobar, to acquire starting pitchers Shaun Marcum and Zack Greinke, who combined for a 29-13 record to help the Brewers win the National League Central and come within five victories of their first-ever World Series title. Two years after moving to Milwaukee in 2002, Melvin acquired slugger Carlos Lee in a four-player deal with the Chicago White Sox. Lee immediately became the face of the franchise and in 2005, he helped lead the Brewers to an 81-81 record - the team's first .500 finish since '92. Melvin learned from two of the best GMs/executives in recent memory in Hemond and Pat Gillick, the architect of the '92 and '93 World Series championship teams in Toronto who was inducted to the National Baseball Hall of Fame last summer and the Canadian Baseball Hall in '97. Former Yankees manager/scout/adviser Bob Lemon recommended a young Melvin to Hemond, believing the two would work well together. "At that point I was throwing batting practice, keeping scouting and advanced scouting reports for the Yankees' coaching staff," said Melvin, who was a special assistant to GM Hemond in 1987. "I didn't know Roland when he got hired in Baltimore. Roland just clapped his hands and said, 'Let's go to work, kid, and have some fun.' We did that and just spent a lot of time together. He was my mentor." Melvin, who never pitched in the majors, first met Gillick in the spring of 1975 after being released from a two-year stint in the Pittsburgh Pirates' organization. Gillick, as co-ordinator of player development with the Yankees, gave the then 22-year-old Melvin a tryout - a 10- to 15-minute bullpen session - during spring training. New York usually conducted their tryouts and workouts before camp opened. Gillick liked what he saw from Melvin, signed him to a minor-league contract and sent him to pitch in the Eastern League for the West Haven (Conn.) Yankees. Melvin played through the 1978 season - going a combined 29-19 with a 3.43 ERA in the Pirates and Yankees systems - and soon realized he was no longer a major-league prospect, and turned his focus to scouting and player development. Melvin kept an eye on Gillick, who had joined the Blue Jays two years earlier as their vice-president of player personnel, tracking his shrewd trades and success along with that of his staff, including former Jays GM Gord Ash- Melvin's longtime assistant in Milwaukee. Melvin was baseball operations assistant with the Yankees in 1983 and later scouting director before moving to Baltimore, where he was assistant GM and director of player personnel from 1988 to 1993. Gillick remembered Steinbrenner quizzing him about Melvin's business acumen. "I said, 'I think he's a bright guy,'" Gillick said over the phone. "Doug was a guy who wanted to learn, he never had all the answers. But he was a good listener and liked to observe how different people did things, and I think he took something from everyone that helped him along the way." Gillick said Melvin has a passion for the game and is a "good guy" in the industry, someone who can be trusted, adding Melvin has used the Brewers' increased revenue in recent years wisely when it comes to putting a competitive product on the field. He picked up 2007 AL Cy Young winner CC Sabathia for the 2008 stretch run and watched the burly left-hander fashion an 11-2 mark and 1.65 ERA in 17 starts, leading Milwaukee to an NL wild-card berth. And when the Brewers had a couple of holes in the starting rotation, he brought Marcum and Greinke to town. "Doug's done some very innovating, out of the box-type things for his ball club," Gillick said, "and at the same time has made some very hard decisions [like not re-signing slugging first baseman Prince Fielder this off-season]. At 59, Melvin wants to help instill that passion in aspiring GMs "and help them spend as many years in the game as I have." From his experience with Hemond and Gillick, he spoke of valuing every employee's position in the business and holding them in high regard while remaining connected with people and being respectful of the game. Melvin allows his younger employees to be part of the decision-making process, trusting "they don't let things out of the room," and will take two or three of them from pro scouting or amateur scouting to lunch each day. "That's how you learn in this game, talking about it," said Melvin, who gained notoriety across North America when signed Alex Rodriguez to a 10-year deal worth $252 million US before the 2001 season. "It's the best business that I think you can be in that you can manage by storytelling. I don't have a college degree and I don't think you have to. Have integrity, be honest with people, and respect the players and the game." Melvin will skip the Brewers' three-game interleague series in Chicago against the White Sox in late June, pick up his parents in Chatham and make the two-hour drive to St. Marys. "Being recognized in my home country means a lot to me. I'm really humbled by it," he said. "I thought if I was recognized it might be later on [after I retired], but I still hope to work for another four or five years." Given his reputation and solid track record on the trade front, bet on Melvin achieving that goal. Doug Harrison Doug Harrison joined CBCSports.ca as a senior writer in 2003. Prior to that, the Burlington, Ont., native was a writer/editor at Faceoff.com.